Hampton Sun was inspired by the beautiful beaches of the Hamptons and created especially for individuals who enjoy the sun but not the burn. Hampton Sun products provide superior skin treatment for every category of sunbather. Hampton Sun’s Smart Serious Sunbathing offers unique formulations that combine the most effective moisturizers, anti-oxidants and sun protection ingredients to provide the most flawless and enviable tan possible. With a clean-lined package design and a signature fragrance reminiscent of the region’s blooming privet hedges, Hampton Sun products embody the simple pleasures that make up the magnetic allure of the Hamptons. To be truthful, I haven't found a tanning lotion i'm completely gaga over. Yes, I've reviewed a few, and I like them for a week or so but something always bugs me. It could be the horrible smell, the streaks, or the orange color. One of the previous tanning lotions I tried would just flake off and leave horrible spots. When I heard about Hampton Sun, I was very resistant. I think I've tried every tanning lotion on the market, and I had almost given up. But when I read about Hampton Sun on Sephora, and read the reviews, I knew I had to give it a go. The Sunless Tanning Gel ($32) gives an ultra natural looking, streak-free tan within just a few hours of application. Unlike many self tan products, it leaves the skin incredibly smooth and with no lingering scent. I applied this and saw no color right away, and was very curious why I saw no color. However after a couple hours, the color appeared right away. No streaks, and the BEST part about the Sunless Tanning Gel is there is NO smell. 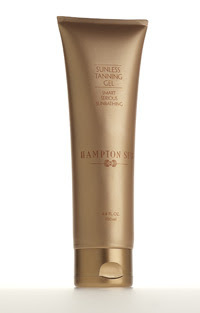 The Giveaway: Hampton Sun is giving one reader a bottle of their Sunless Tanning Gel ($32) to one of you lucky ladies! To enter, visit Hampton Sun and tell me another product you might want to sample!! Follow Hampton Sun on AND me on Twitter, and tweet this giveaway (Up to once a day!) OR you can let your friends know about this giveaway on Facebook! Good luck! Giveaway ends 10/19/10. Winner will have 48 hours to respond to the winning email or another winner will be chosen. Open to the US only. No Po Boxes please. I would love to try the Private Bloom Shower Gel. I would also love the Serious Shimmer Cooling Spray "Pearl"
I'd love to try the SERIOUS SHIMMER COOLING SPRAY "BRONZE" also! I like Hampton Sun on Facebook! I like the PRIVET BLOOM SHOWER GEL. Another product that I would love to sample from Hampton Sun would be the "SERIOUS SHIMMER COOLING SPRAY 'PEARL'!" I "Like" Bella's Beauty Spot on Facebook! I "Like" Hampton Sun on Facebook! I love the Serious Shimmer Cooling Spray "Pearl"
I'd like to try the Private Bloom Shower Gel. I would love to try the Privet Bloom Shower Gel. I like Hampton Sun on facebook. I would like to try the Privet Bloom Body Lotion. shower gel does smell nice! Privet Bloom Shower Gel my product I would like to try! liked Hampton Sun on facebook. Id love to try the SERIOUS SHIMMER COOLING SPRAY "BRONZE"
I'd love to try the Serious Shimmer Cooling Spray "Pearl"! I "Like" Bella's Beauty Spot on Facebook. I "Like" Hampton Sun on Facebook. id like to try the Serious Shimmer Cooling Spray "Pearl"